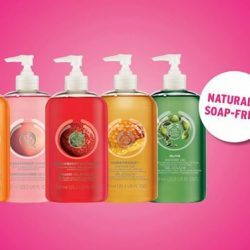 Till 31 Oct 2016 The Body Shop: Selected Shower Gels at $5 Each! 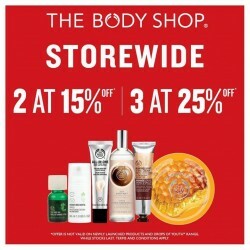 Get your shower goodness at just $5 now at The Body Shop! Till 31st Oct only so stock up on all your favourite scents before it’s gone! Feel so good with our soap-free and natural shower goodness! Try them before they're gone! Don't forget to get a new look for the new year! Colour Crush eyeshadows and lipsticks going for Buy Two Get One free. With so many fantastic shades, you will be spoilt for choice! Enjoy for 3 more days only. Stock up on these shower goodness before it's gone. Valid at all store except IMM. Offers is valid on selected shower gel and while stock last. Term and condition apply. 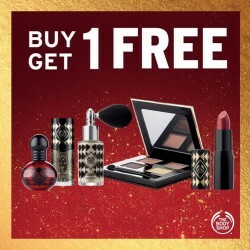 Enjoy for a New Year Eve party special Edition Winter Trend Make-up Collection going for buy one get one free now. Grab them now and sparkle on. The Body Shop gives you a reason to indulge for the new year! Their selected Special Edition Bath & Body items as well as candles & home fragrance oils are going for BUY ONE GET ONE FREE! Stock up before they are gone for the year! They have got you sorted. Their seasonal Bath and Body Feel Good Tins are going at 30% off! They look and smell perfect! Limited stocks only so head to the stores before it's going going gone! Just for LOVE YOUR BODY™ club members! From now till 16 Dec, enjoy 30% OFF store wide & special buys of up to 50% OFF. Head in stores now before it's over! Not a member yet? Fret not. Simply spend $40 nett & join! Also exclusively for Citibank Cardmembers, get a complimentary $20 voucher with $100 nett spend. T&Cs apply. It’s Black Friday! Head in stores to enjoy a storewide offer of up to 25% off. Beat the Christmas crowd and get your Christmas shopping done now! The Storewide special 2 at 15% off and 3 at 25% off. The Body Shop products are always a great gift for Christmas, so exclusively for DBS/POSB cardmembers, get 20% off storewide from now till 30 November 2015! Applicable for regular-priced items, gift sets and selected newly launched products, excluding gift vouchers, fundraising products and unless otherwise stated. 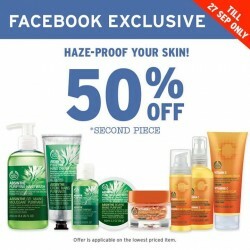 Valid at all The Body Shop stores in Singapore except IMM. Just for your our LOVE YOUR BODY™ club members, don't miss out on The Body Shop Christmas sale preview with 20% OFF storewide, lucky spin & complimentary gifts! Also get member exclusive special buys at up to 45% savings. 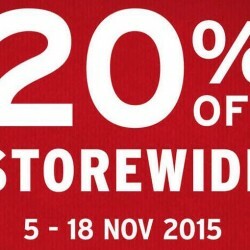 Happening from now till 18 November 2015, get your favourite products now! Enjoy The Body Shop offers with their Absinthe hand care range & pile on the antioxidants for your skin with Vitamin C range. All these at 50% OFF 2nd piece, till 27 Sep only & while stocks last. Offers is applicable on lower price items. 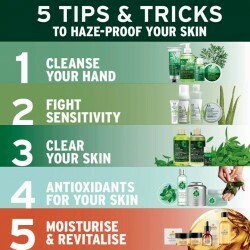 Haze-proof your skin with these 5 tips and tricks! And don't forget there's a store-wide 20% OFF in stores now till 20 September for all their LOVE YOUR BODY™ club members. Still to cleanse your hand, Fight Sensitivity, Clear your skin, Antioxidants for your skin, Moisturise and Revitalise. 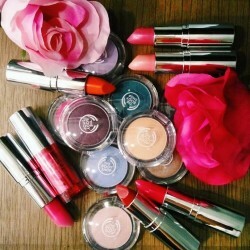 Are you a fan of the Body Shop products? 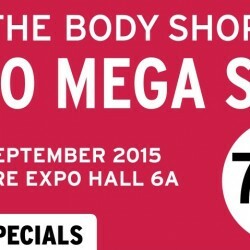 If you are, here’s some good news: From 11 to 13 September 2015, The Body Shop is having their Expo Mega Sale with discounts up to 70% off! Check out the daily specials and there will be a Free Gift exclusively for DBS/POSB cardmembers with $80 nett purchase in a single receipt. Stock up on your essentials now! 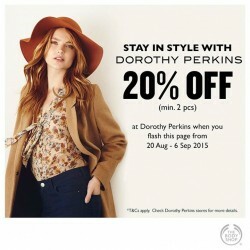 Enjoy The Body Shop of 20% off sale of Dorothy Perkins! Stay in style this season, flash this post to get 20% OFF at Dorothy Perkins. Exclusively for you beauty lovers! To celebrate this awesome occasion, for 100 hours, all their gift cubes are going at $5 only minimum of 2 pieces! Offer starts tomorrow at 6pm sharp! The body shop are counting down to their amazing Country 50th birthday. They offer Special Edition Shower Gels for $6.90 each minimum 2 pieces with its usual price $12.90-$14.90. Offer is valid on selected shower gels and while stocks last. Terms and conditions apply. Check in stores for more #SG50 deals! $6.90 (UP: $12.90-$14.90)/ min. 2 pcs. Are you a fan of the Body Shop products? 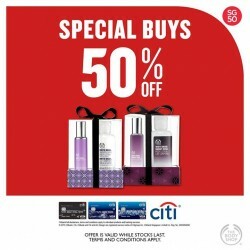 If you are, you should sign up for Citibank credit cards as the Body Shop collaborates with Citibank for exclusive promotions for its cardmembers quite frequently. 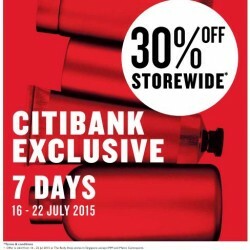 If you are a Citibank cardmember already, here’s some good news: From 16 to 22 July 2015, you will enjoy 30% off Storewide at all the Body Shop stores in Singapore except IMM and Metro Centrepoint! Their Deep Sleep Dreamy Pillow & Body Mist is highly recommended to help you relax before sleep and their delicious smelling shower gels are a definite bestseller. 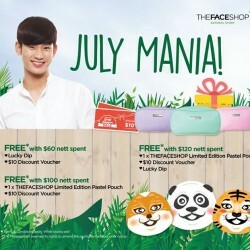 Chase away the Monday blues and walk away with these exclusive gifts with purchases when you shop with THEFACESHOP this July! Look out for the limited edition Makeup Pouches in 3 gorgeous pastel shades! Hurry! Head to our stores before our SALE ends tomorrow! 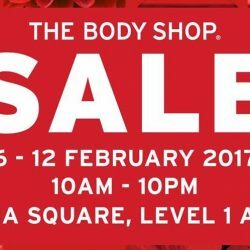 2 at 15% off and 3 at 25% off @ TheBodyShop. So, what are you waiting for? Come and hurry! 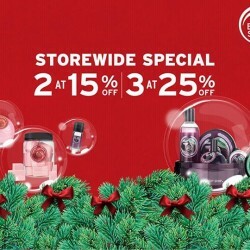 The Body Shop: Storewide promotion 2 at 15% off and 3 at 25% off. Limited period only 50% off body mist NOW at $9.95 each (usual $19.90 each). So, what are you waiting for? Hurry! The Body Shop is one of the most popular wellbeing stores in Singapore. Over here, we can find make ups, skin care products, home fragrance and hair care products. Now, we can have them at a cheaper price at Singapore Changi Airport. 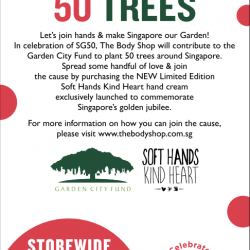 However, good news is that in conjunction with SG50, The Body Shop is having 50% Special Buys Exclusively for Citibank card members & our LOVE YOUR BODY™ club member! Offer is valid while stocks last. Terms and conditions apply. Enjoy and get Up to 50% off discount on body polish & body lotion Now $9.5 - $11.45 each (usual price $18.90 - $22.90 each) so hurry grab your self a great deals!